The True Tel Aviv vacation package is ideal for guests who are looking to visit the vibrant city of Tel Aviv, enjoy the sea, sun and sand, and use this exquisite city as a starting point to explore the sites of Israel. True Israel will show you all aspects of Tel Aviv, from Carmel Market to the intricate antique shops of Jaffa. We will help you discover the “real” Tel Aviv, providing recommendations for restaurants and activities preferred by the locals. 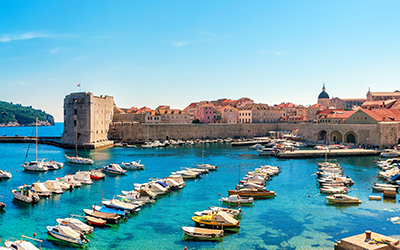 Welcome to Dubrovnik, a beautifully preserved Dalmatian town full of history! Once settled-in at your luxury boutique city hotel, venture out to explore this magnificent and charming city, also known as the ‘Pearl of the Adriatic!’ Together with your private True Trips guide uncover the best-kept secrets of the city and its surrounding areas. Wander the immaculately preserved, bastion encrusted, city walls that surround Dubrovnik’s historic center and are a UNESCO World Heritage site since 1979. Follow your guide inside the city walls and explore the Rector’s Palace and Sponza Palace, the magnificent Cathedral of the Assumption, and the Franciscan monastery and museum. Dubrovnik will leave you in awe of its impressive buildings. Immerse yourself in the rich culture and get better acquainted with local life. Wander through the picturesque streets with elegant squares and admire the impressive architecture, then do some shopping before enjoying a delicious al fresco lunch at one of the elegant seafood restaurants. If you find yourself with enough time, you may like to head up to Srđ - the hill overlooking Dubrovnik – for a stunning panoramic view of the city and surrounding islands, or hop on Dubrovnik’s cable car for one of the city’s most striking views – a mosaic of terracotta rooftops from the old town against a backdrop of deep blue sea. One thing is for sure, Dubrovnik is a small piece of paradise on Earth that will keep you coming back for more!